2.Alternatively, you can visit this link to check out the various licensing plans available. 3.Explore the various plans available and select the one which best suits you. 4.Click the Upgrade Now button for the plan to which you want to upgrade. You will be redirected to the miniOrange payment portal from where you can purchase your plan. 5.From the Select License Plan dropdown, choose the plan to which you want to upgrade. 6.Select the number of instances for which you want to use the plan. 7.Choose the type of support you want. Also make sure that the small button to the left of support dropdown is green, which just means that you are opting in for support. Note: It is recommended to choose any support to get future upgrades of the plugin. 8.Next, select the support hours if you need the miniOrange support team to setup the plugin. 9.You can view the total amount you need to pay in order to purchase the plan you requested. 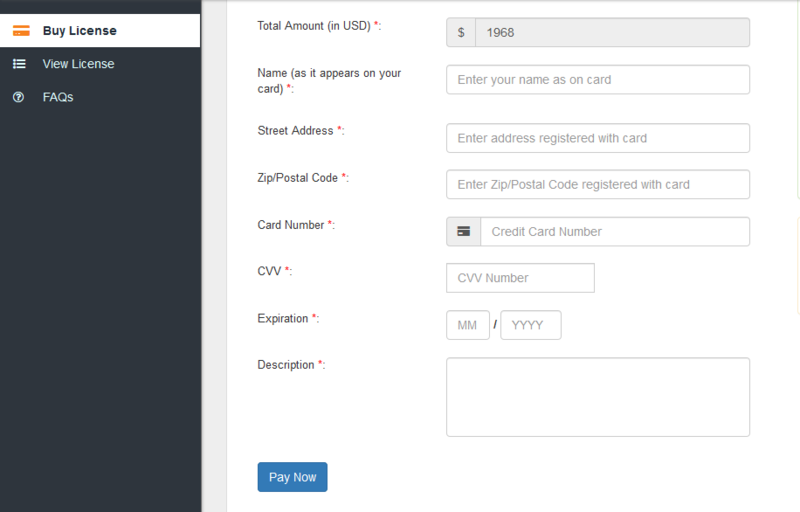 10.Enter your name, address and card details and finally click on the Pay Now button to initiate the payment. 11.After successfully completing the payment process, you will get a Transaction completed message as shown below.